Connect to DIN 477 / W21.8 / BS 341 No. 8 or CGA 320 donor/parent cylinders. Dump valve for safe and controlled release of gas. High quality design and manufacture. Integrated pressure gauge for safety. 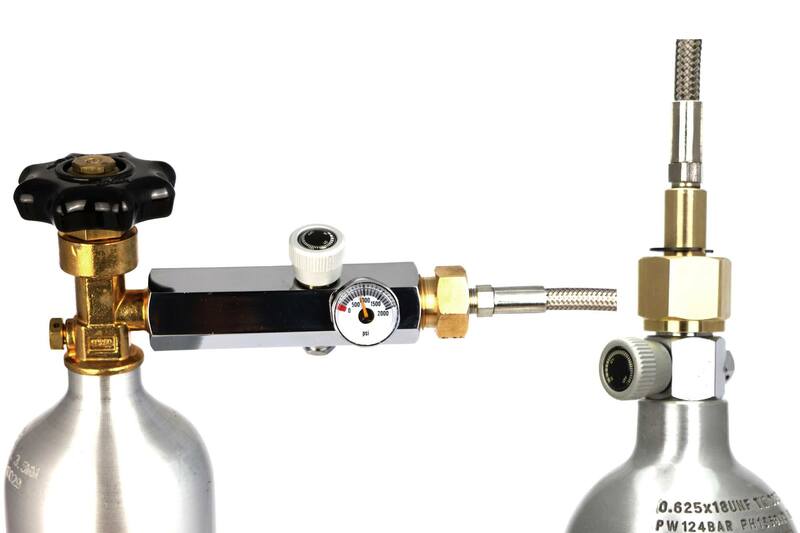 The CO2 Refilling Adapter is used to safely refill cylinders from larger donor cylinders. It is designed to connect to either a CGA 320 or DIN 477 / W21.8 / BS 341 No. 8 donor cylinder, and then connect either directly or via a high pressure hose to the recipient cylinder. The Refilling Adapter is designed to allow refilling of DIN 477 / W21.8 / BS 341 No. 8 CO2 cylinders, or you can add an adapter for refilling of SodaStream or Paintball / CGA 320 cylinders. The refilling adapter also includes a pressure gauge to ensure the pressure of the donor cylinder will not exceed the pressure specification of the recipient cylinder. The refilling adapter also has a dump / purge valve to safely release the residual gas within the adapter once refilling is completed. Connect the refill adapter to the parent / donor cylinder. Screw the connection hose into the refill adapter. Screw the cylinder into the end of the connection hose. Open the valve on the parent / donor cylinder to release the gas. Turn the shutoff valve to release the gas. Open the valve on the CO2 cylinder to inject gas into the cylinder. You will hear gas flowing into the cylinder. The pressure gauge will slowly increase as the cylinder fills. Once refilling is complete, stop the CO2 by turning the shutoff valve. Close the valve on the recipient CO2 cylinder. Release the residual gas by opening the dump / purge valve. Remove the cylinder from the connection hose. Repeat the refill process for each cylinder. Once finished, close the valve on the parent / donor cylinder. This adapter is a special tool. It is small but contains in itself many comfortable and intelligent features. Pressure gauge, recirculation flow regulator and valve to depressurize after charging. What is more robust is the pressure gauge that gives the possibility to load our cylinder at very precise pressure values. I tried a lot around but I did not find anything like that. It is expensive but also read more... This adapter is a special tool. It is small but contains in itself many comfortable and intelligent features. Pressure gauge, recirculation flow regulator and valve to depressurize after charging. What is more robust is the pressure gauge that gives the possibility to load our cylinder at very precise pressure values. I tried a lot around but I did not find anything like that. It is expensive but also a truly unique object, designed and designed by intelligent people. Congratulations to CO2 Supermarket. I did not think it was coming from England and I pressed a little to know about the expedition which, in light of this, was quick and treated as packaging. Excellent. I am so impressed with CO2 supermarket - not just because of the products but for their knowledge of what parts are needed for unusual situations, their responsiveness and their willingness to go over and above with their customer service. I can’t rate them highly enough. Thank you!!! I am so impressed with CO2 supermarket - not just because of the products but for their knowledge of what parts are needed for unusual situations, their responsiveness and their willingness to go over and above with their customer service. I can’t rate them highly enough. Thank you!!! Good quality and easy to use, good operating instructions! Good quality and easy to use, good operating instructions! Arrived in less than a week from my order date and worked perfectly for filling my 5# Keezer bottle. Very high quality product, I envision years of use! Arrived in less than a week from my order date and worked perfectly for filling my 5# Keezer bottle. Very high quality product, I envision years of use!